I like to keep a small knitting project with me at all times, for those little bits of time that may present themselves unexpectedly (queuing, delays on the Tube, fire drills, waiting outside shop fitting rooms while your friends tries stuff on…). A good portable project should be small enough to fit into a handbag (or coat pocket), easy to memorise so you’ll be able to bring it out at a moments notice and start knitting straight away, yet interesting enough for you to want to knit it. For me, these socks tick all three boxes. 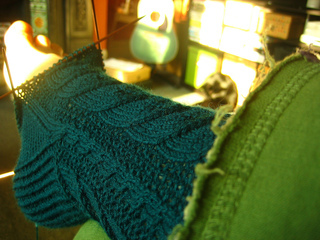 A leaf panel in simple lace knitting combined with small cables at the sides add interest without making the project too complicated.